This note of further evidence examines the implications for the Scottish Government’s UK Withdrawal from the European Union (Legal Continuity) (Scotland) Bill of the list of devolved topics interacting with EU law which the UK government wishes to reserve pending the agreement of replacement frameworks. No permanent reservations are apparently proposed by the UK government, and as a consequence any UK frameworks would be subject to subsequent amendment or repeal by the Scottish Parliament. They can therefore only operate if they continue to be agreed. The main areas in which legislative frameworks are proposed relate to agriculture, food and fisheries matters. These are likely to be the subjects of some continuing international obligations in relation to trade, so there is a reserved as well as a devolved interest in them, and the UK government will under the devolution settlement retain its powers of direction to ensure international obligations are met. The UK government also lists some areas which it considers to be reserved. Whether they are or not is a question of law. The most significant of these is State Aids. There is a strong case for reservation of this matter in any event, not to constrain the devolved administrations, but rather the government responsible for England, to follow common rules. There is in fact little difference between the two governments, and an agreement under which the Scottish government accepts that there will be some temporary reservation, but the UK government agrees to a backstop date by which this will end should enable this Bill to be dropped. The UK government’s publication lists first of all a large number of areas where EU law affects devolved competence, and where some degree of coordination may be required across the UK after Brexit. This is described as not requiring legislation, although it is quite possible in practice that both Holyrood and Westminster primary legislation or regulations will be required for some of them. None of this, however, is problematic, and is not discussed further here, except to illustrate that the number of issues of dispute is actually quite small. A number of areas are, however, listed (discussed in detail in the next section) with a view to being reserved until UK common frameworks are agreed. It is apparently envisaged that these frameworks will be legislative, and in consequence the subject initially of legislation in Parliament at Westminster. The government is not, however, apparently proposing permanent reservation in respect of any of these areas. As a result, that legislation will be subject to repeal or amendment by the Scottish Parliament (and the other devolved legislatures) at a future date. An inevitable consequence, therefore, is that these proposed UK frameworks will only continue to operate if there is agreement between the UK and devolved legislatures about them. That appears to meet the Scottish government’s negotiating objective. To the extent that temporary reservation has a purpose, therefore, it is to provide a breathing space for discussion, and greater clarity about the implications of EU withdrawal, which is unexceptionable. It may also be intended to give greater leverage for the UK government as the proposed frameworks are negotiated, in that devolved powers will only be handed over once they are agreed. In the absence of agreement, they might never be: but any Scottish government is apparently at liberty to agree and subsequently amend the framework. There is an objection in principle to UK ministers having the power to determine the boundaries of devolved competence without consent, but this approach could be made wholly unobjectionable if an end date was set for the proposed temporary reservation. The Scottish government’s argument is that all such frameworks should be “agreed”, but as noted above, they can only keep operating if they are, so Scottish Ministers’ stated objective has apparently been achieved. The list of devolved areas proposed for temporary reservation has all the characteristics of a trawl across nervous Whitehall departments for things that might cause them problems. These fall into a few broad categories. It will be in Scotland’s interest, and the best interests of the Scottish government, to negotiate an agreed legislative framework, so that it can be sure that the UK government will adhere to it for English agriculture also, and in doing so it should able to exercise some leverage over UK-wide policy and expenditure, by virtue of the fact that these matters will be devolved thereafter. The UK government will of course retain its powers of direction in the Scotland Act to ensure any international obligations are discharged, and it will be providing the resources for agricultural support. Fisheries is also on the list, and it too is likely to be subject to continuing international obligations, as the EU seems likely to demand access to Scottish waters as a condition of trade in fish products. It is not clear at present, therefore, what UK-wide framework will be appropriate, but the government nevertheless proposes devolution in the long run. The remainder of the list has a miscellaneous feel to it, including such matters as emissions trading and the market in services (in both of which a UK market is self-evidently necessary), recognition of medical qualifications (which seems unnecessarily precious) and public procurement. The last would replace EU public procurement rules, and it is perhaps surprising that the UK government have not argued for reservation. It will be in the interests of the Scottish government to argue for a firm UK framework, so that a future UK government cannot discriminate against Scottish suppliers bidding for public contracts in England. Assuming that Britain does leave the EU, reserved matters currently dealt with in Brussels will be dealt with in Parliament at Westminster. For some reason, the UK government has chosen to include a number of these in its paper. If they are indeed reserved, this is irrelevant to the issue under discussion. The most significant of these is State Aids. The EU State Aids regime restricts government subsidy of industry in the interest of promoting free competition across the Single European Market and so economic efficiency. The restrictions are not absolute: indeed the structural funds regime directs subsidies to worse-off areas. If the UK leaves the EU, the State Aids regime will no longer apply, but there will be a good case for replacing it with something similar, so that government subsidies to industry can be channelled as an instrument of regional economic development. This only makes sense if it is applied at a UK level. Over the decades since the 1960s, Scotland has been a beneficiary of such regional economic development policies, perhaps less so in recent decades as it has become one of the better-off regions of the UK. While Scottish governments will naturally always try to argue for the maximum resources to come to Scotland, it will be in their interests to argue for a well-defined UK framework, so that there is not a free-for-all in subsidy for economic development, and so that the government in its English responsibilities is constrained by common rules in attracting industry which might otherwise come to Scotland. There is already in existence a Concordat from 1999, which is intended to stop competitive bidding for mobile investment between different administrations in the UK; it may provide some assistance in developing such a framework. If, as the Scottish government argues, State Aids is not wholly reserved, then it may have more leverage in influencing such a framework. The UK government’s intention in publishing this list is evidently to demonstrate that the areas of contention between it and the Scottish government over clause 11 of the European Union Withdrawal Bill are quite narrow. 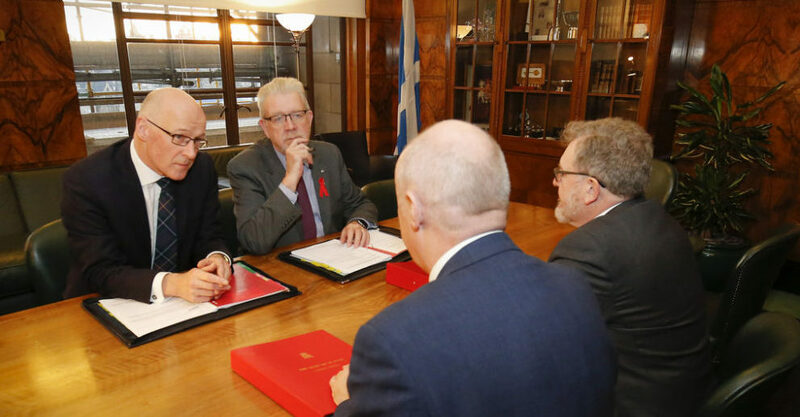 To some extent it has succeeded in doing so, but more importantly it has apparently agreed that any future UK frameworks in relation to devolved areas will be subject to the continuing agreement of the Scottish government and Parliament. That is the necessary implication of saying that the matters will be devolved, and not reserved. The remaining point of principle, therefore, relates to the government’s intention to have temporary reservation without explicit limit of time and whether it is a breach of the principles underlying the devolution settlement. It is, in that the powers of the Scottish Parliament should not be subject to unilateral amendment by UK Ministers, but this is increasingly becoming something of a theological distinction. It is certainly not, as some of the more hysterical commentators have suggested, destructive of the devolution settlement. Both governments involved seem to have dug themselves into deep trenches over in essence one very narrow point. Both agreed that all EU powers which relate to devolved matters will be devolved, and as a result the Scottish Parliament will have its effective competence substantially extended. It will no longer be subject to the constraints of EU law, will only be constrained by UK law in these matters to the extent to which it agrees. Both governments are agreed many of these should be subject to common frameworks, some of which will be legislative. The only real point of disagreement is the government’s proposed temporary reservation of the areas in the list. It would be unreasonable of the Scottish government to object to temporary reservation as a matter of principle, as there remains deep uncertainty about the extent to which power is available to be devolved at all, given the state of negotiations about EU withdrawal. Equally, it would be unreasonable of the UK government to insist that such temporary reservations can be without limit of time, just to give themselves leverage in the negotiation of the replacement. The scope for compromise is obvious, and as a result this legislation (the Scottish government’s continuity Bill) can be dropped. Jim Gallagher is Visiting Professor, University of Glasgow, and Nuffield Associate Member. He was Director-General for devolution in the Cabinet Office/No 10 Policy Unit until June 2010. Love how this self serving opinion piece is full of if, but, probably and maybe’s about possible future events. Clearly a unionist wrote this opinion it offers no actual facts to base its conclusion on. Jim Gallagher an ex Cabinet Office Director is hardly an impartial source and it tells. No mention of the basic facts that democracy is being run rough shot by the UK Government and the majority of the Scottish voters voted to Remain in EU. All just glossed over. No mention of the basic facts that Scottish Agriculture is a much larger % of the Scottish Economy and so protecting that sector is more important in Scotland that in UK as a whole. A long propaganda letter would perfectly describe this self serving piece. Do we trust these UK political types to accurately protect Scottish powers? Bizarre article containing poor logic as epitomised by the final sentence quoted above. Even if someone did happen to sympathise with JGs views – anyone who has ever negotiated anything as contentious as a child’s bedtime would know that you NEVER drop your major bargaining point merely on the grounds (i.e. a vague trusting hope!) that there is ‘obvious scope for compromise’. That would be naive! So no, the Scottish Government cannot drop the continuity bill as things presently stand in face of ambiguous and unclear signalling from the UK Government about the continuing status of our devolved parliament.